The “cage” that binds us, the “cage” that protects us; within its confines, we whisper words of despondency conceding to the fate within the “cage” we find ourselves existing in. Through that state of being, we further extend the reach of confinement to immure our state of mind and further imprison us within this illusionary notion of “imprisonment” to the point of making us blind to the fact that there was never a “cage” there in the first place. To be free within the confines of a “cage” expresses itself to be the boldest form of freedom…Neji’s “cage” and ‘state of imprisonment’ disappeared the moment he realised he was never outside the realms of freedom. To think Neji’s death would strike such a overflowing vein within the Shinobi Alliance, he must have been incredibly respected even outside Konoha. The metaphor Kishimoto-sensei used to convey the spirit of Neji was beyond poetic, it was a privilege to witness; the notional “cage” created by the mark of the Hyuuga clan highlighted by Tobi who emulated that imprisonment through the limbs of the Jyuubi enclosing off the Shinobi Alliance and trying to incite everyone with the only escape being death. All of that cut through by a ‘bird taking flight’ towards the skies beyond, towards the world beyond, towards the freedom beyond…and that bird represented Neji who was like a bird flying free from its “cage” it was supposed to be confined in. That scene echoed once again the “freedom” expressed by Neji through his death and the choice he made void of any concepts of “fate” or “destiny”. Even Naruto had to overcome this concept of “imprisonment” when he found himself alone as a child and when he realised what he really was (the Kyuubi Jinchuuriki). With a few supporting hands Naruto was able to take flight and soar through “that cage” he found himself in and astonishingly enough, his flight of freedom invoked many others to escape from their notional “cages” and soar along with him towards the freedom of the “future”. Naruto even freed the Kyuubi from the “cage” it constricted itself within (the “cage” beyond the Eight Trigrams Seal). The very fact that Naruto chose to ally with his parent’s killer should express to Tobi just how different the two of them are, but sadly Tobi seems to be ignoring that part completing, I just wonder what exactly Tobi is fishing for from Naruto =/. Hinata, oh yes, oh hell yes, I loved how she knocked Naruto’s shoulder bone back into place with her [loving] Gentle Fist. Mmmmm, feels good seeing the Naruto and Hinata pair function so sweetly and complimentarily. Would love to see more moments like this =D. 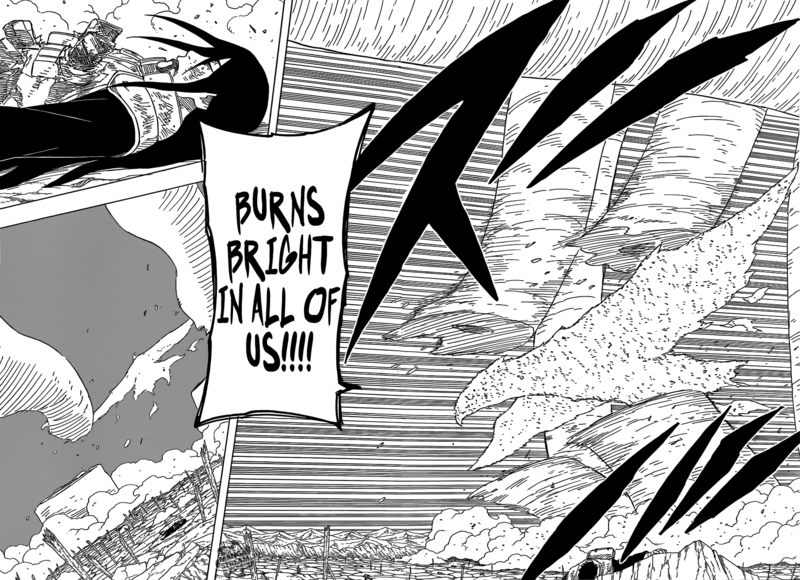 Great great chapter, really looking forward to seeing how things with develop in that battle, although it seems we will finally get to see what Sasuke and Orochimaru were looking for next chapter – will the identity of person Sasuke wants to speak with be revealed? O.o. 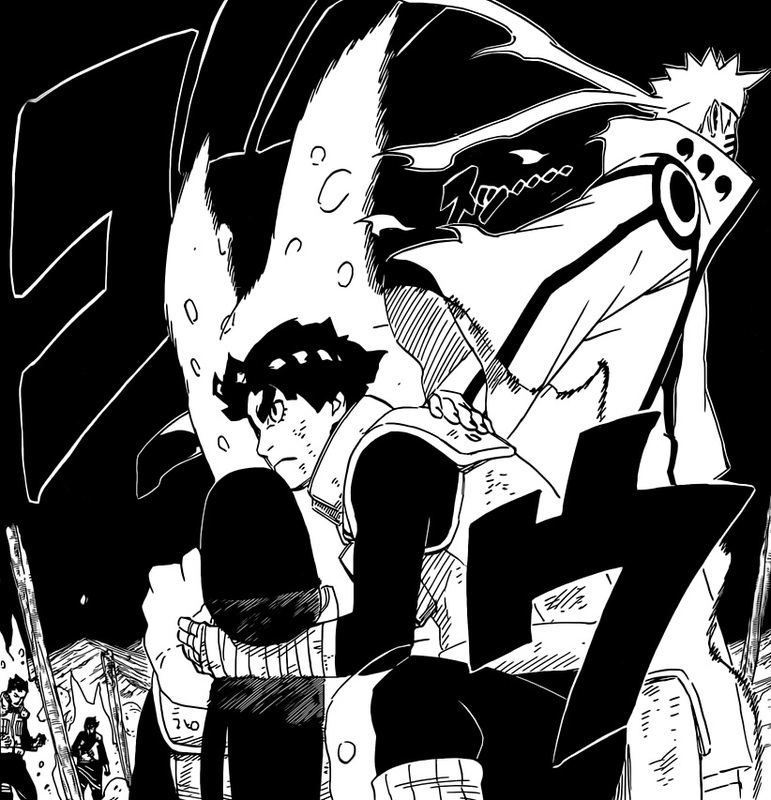 This entry was posted in Naruto and tagged Kishimoto Masashi, Kurama, Manga, Naruto, Neji, Rock Lee, Shinobi, Uzumaki. Bookmark the permalink.